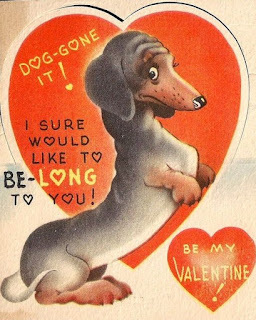 I thought you might enjoy a few vintage Dachshund Valentines today. These are all old fashioned cards that children exchanged on Valentine's Day. "Dog-gone it! I sure would like to be-long to you! Be My Valentine!" A Dachshund shares a Valentine with a great big dog friend: "Over you I'm simply dippy - ask me and I'll answer YIPPY!" This Dachshund wears a red sweater and hat - and carries a heart. "I long to see you. Dog-gone it!" This little Dachshund went to school with a little girl. "For My Teacher - I Like You." This Dachshund is surrounded by hearts. "I LONG for you to be mine!" "Doggone right - you're my Valentine!" Now this is a very TALL Dachshund. I hope you enjoyed seeing these vintage Valentines! I also hope you have a wonderful Valentine's Day! I'll be back next week with some special pet memories! 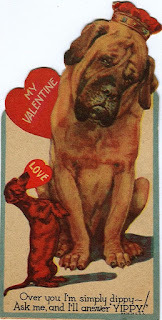 You have cute vintage Valentine's Day cards. I love the idea in sharing it with that special someone or friend. Your cards are adorable! My Mom adores her Dachshund and will love these!!!! 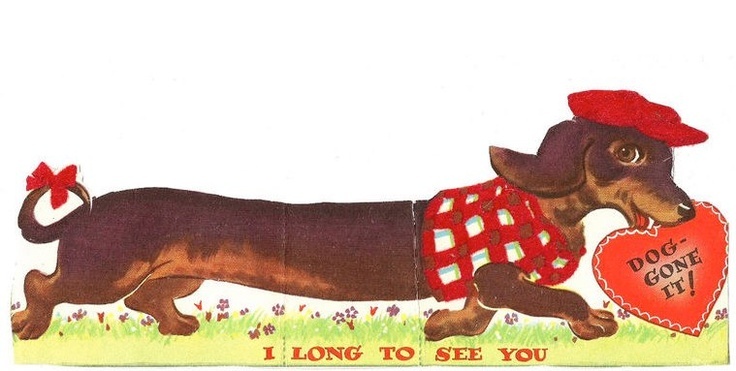 I LOVE these vintage dachshund Valentines. Thanks for sharing them with us. 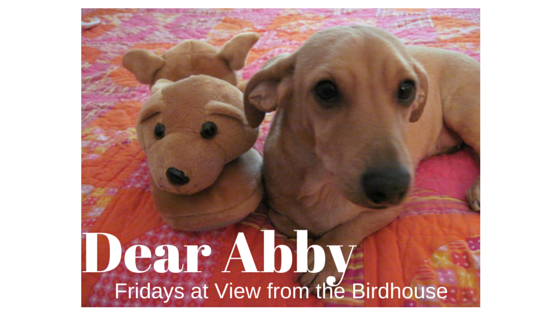 Abby, you are very good at finding lovely dachshund treasures! These are so cute. One of my friends loves dauchsunds and I bet she would FLIP over these! 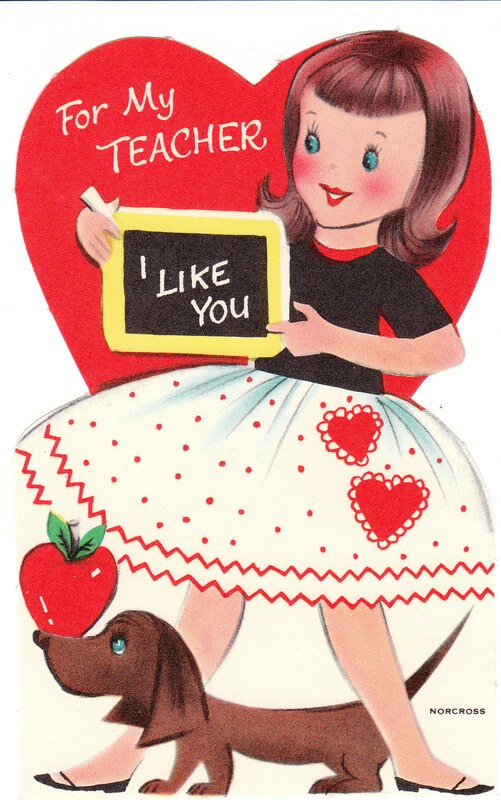 Vintage valentines are the best kind! I remember receiving V-day cards like this when I was a kid :) makes me so nostalgic! I love the design of these Valentine cards. Reminds me so much of the ones I used to get for my mom and dad. These cards are always a winner and the recipient will be super happy to receive to it. Omg how cute are these valentines?!?! My mom has a wiener dog so she would go nuts over these!!!! Very cute! Our daughter has a party at school Tuesday, so we have to fill out her Vtines day cards for friends. 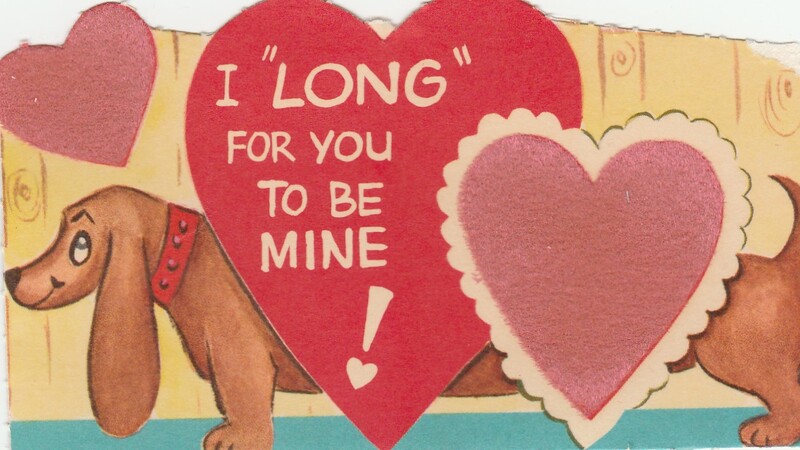 These vintage valentines are so adorable. I think the language of love has been easily understood by all over the years. 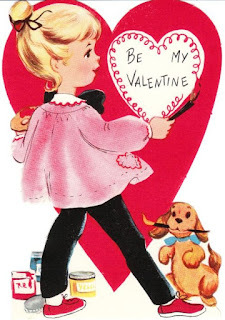 I am in love with all those vintage Valentine's Day cards, they are quiet adorable bringing back the old memories. I love that one from Doggone and the one that is done for Teachers. Thank you so much for visiting! These little Valentines made me happy and I'm glad you felt the same way. My Momma said some of these remind her of cards she gave to friends as a young girl.